Fun waves of curls give you natural look. 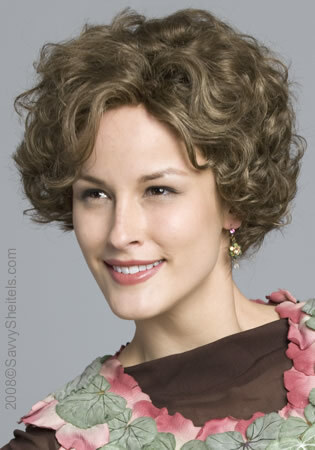 A short, curly, sophisticated look with a wedge cut that tapers to a flattering neckline. Style it with Curls, Waves, Kinks, Frizz or use gel for a slick Wet-Look! Easy to manage in human/synthetic blend hair! Made in Korea with Chinese Remy human hair and 50% High Quality Kanekalon Synthetic Fiber. Super light - weighs only 3.3 ozs. This wig is 100% Kosher - it contains NO hair from India.